On Thursday, IMCCA hosted its annual Lunch and Learn on the state of UCC, featuring a panel of industry members and end users moderated by David Danto, IMCCA’s director of emerging technologies. Danto highlighted some of the fundamental changes to the way we work, such as the fact that many people work remotely, how various departments within companies are now spread out across the globe, and how “water-cooler talk” is now conducted over social media, before prompting the panelists with questions about how the trends shape the way people communicate for work. Discussion began with the issue of “noise,” or the proliferation of different tools for collaboration that overlap one another. “For a lot of end users, as we roll out more and more tools focused on collaboration, the question of which tool, for which use case is something that pops up a lot,” said panelist Mike Bartholomy, senior manager of information security at Western Union. 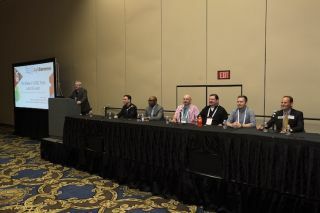 Beyond the debate over simplicity versus flexibility, panelists offered their views on the future of unified communications, touching on a variety of topics such as security, market consolidation, and the continued growth of BYOD.